Posted on April 25, 2018 by Eric Bonnici wrote in Community Events. It has 0 Comment. 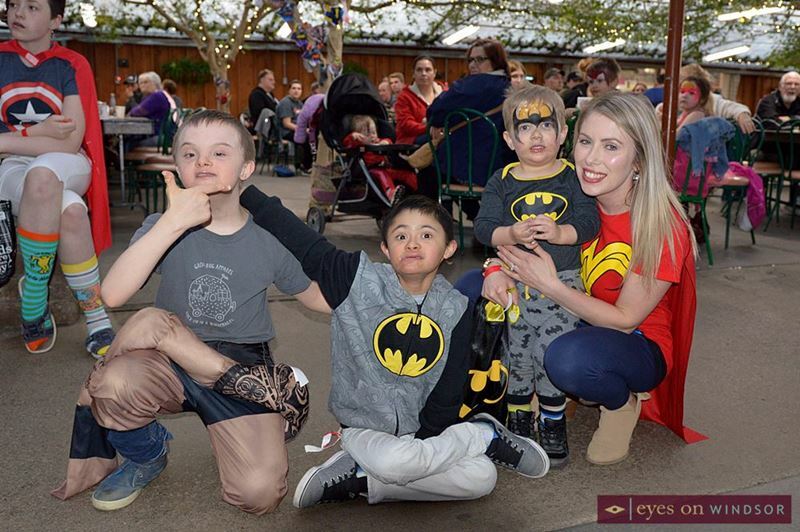 Born with Down Syndrome, Andrew Banar and his mom Karen, the team of real-life superheroes behind Group Hug Apparel, held their 4th Annual Rock Your Socks fundraiser dinner at Colasanti’s Tropical Gardens on Friday, April 20, 2018. 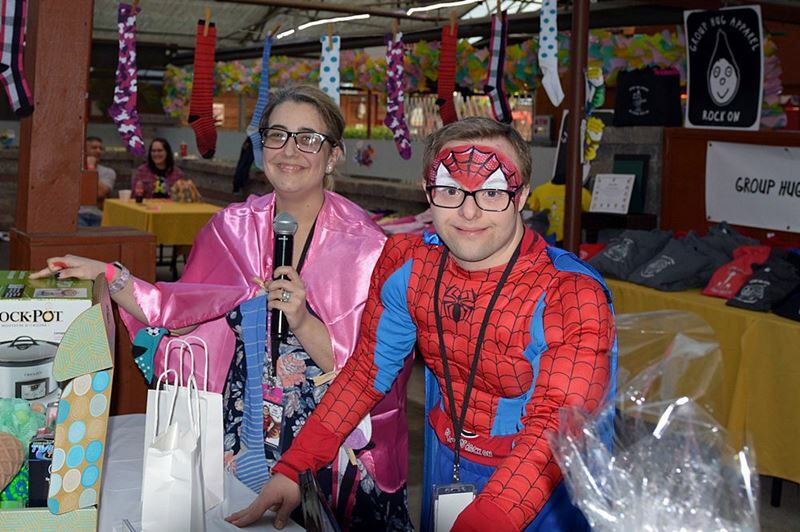 Guests were invited to wear their craziest wildest socks, Group Hug Apparel T-shirts and dress as their favourite superheroes (the theme of the this year’s event). People wore capes, costumes, and superhero attire. 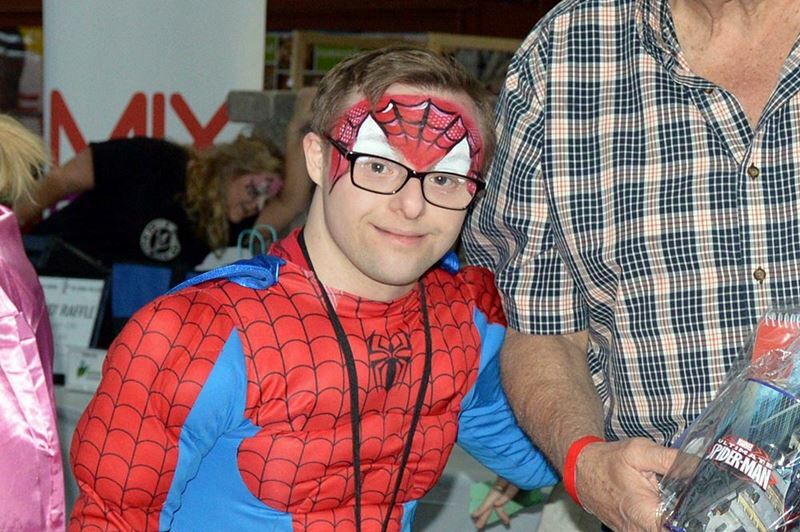 Andrew dressed as Spiderman, his favourite superhero during the event. Rock Your Socks emcee Toni Bruner of Windsor’s 96.7 FM (left) and Andrew Banar (right) draw winners from the raffle table. Photo by Eric Bonnici / Eyes On Windsor. Everyone enjoyed a broasted chicken and pasta dinner buffet, raffles and prizes, mini-golfing, face painting, a bake sale, photo booth, and more. Proceeds from the event goes to support Andrew’s Helping Sick Kids One T-Shirt At A Time Campaign. Andrew sends his t-shirts, a stuffed animal, and a special handwritten note to children worldwide when they face illness and medical treatment. He will even deliver the packages in person whenever possible. His goal is to encourage these children to be brave and strong during their health challenges. After all, Andrew and his family understand, from first hand experience, the challenges of battling health issues and spending time in the hospital. 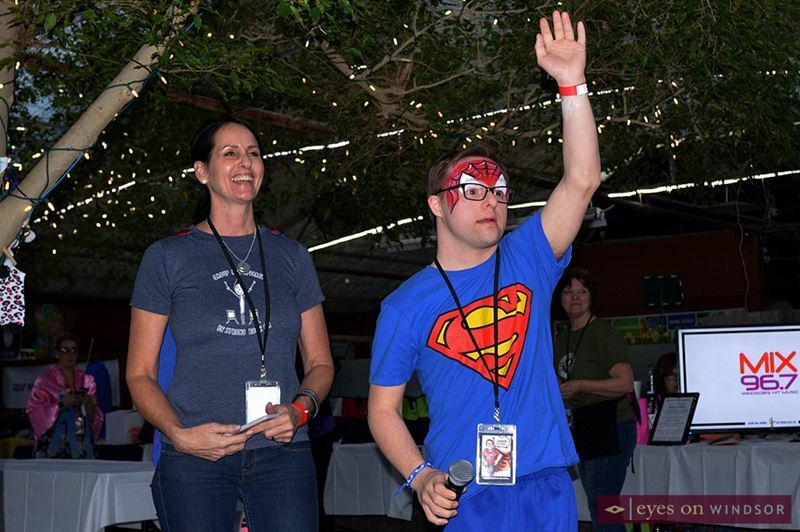 Andrew Banar and his mom Karen thank guests for attending and supporting their 4th Annual Group Hug Apparel Rock Your Socks fundraiser dinner at Colasanti’s Tropical Gardens on Friday, April 20, 2018. Photo by Eric Bonnici / Eyes On Windsor. Andrew also donates a portion of the funds he raises from events and merchandise sales to local charities such as W.E. Care For Kids Foundation, Children’s Health Foundation, Community Living Essex County, and Transition to Betterness. In the past 11 years Andrew has raised over $90,000, which he donates to charities or puts towards his Helping Sick Kids One T-Shirt At A Time Campaign. 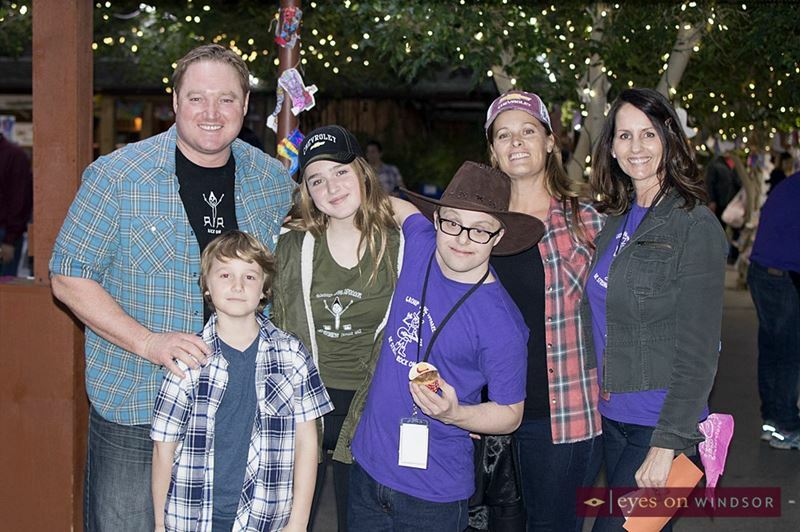 Group Hug Apparel’s 4th Annual Rock Your Socks event raised a total of $8,500, with over $31,000 in total over the past four years of holding the fundraiser. In addition, Andrew and Karen attend many community events and festivals throughout Windsor Essex where they also sell merchandise. 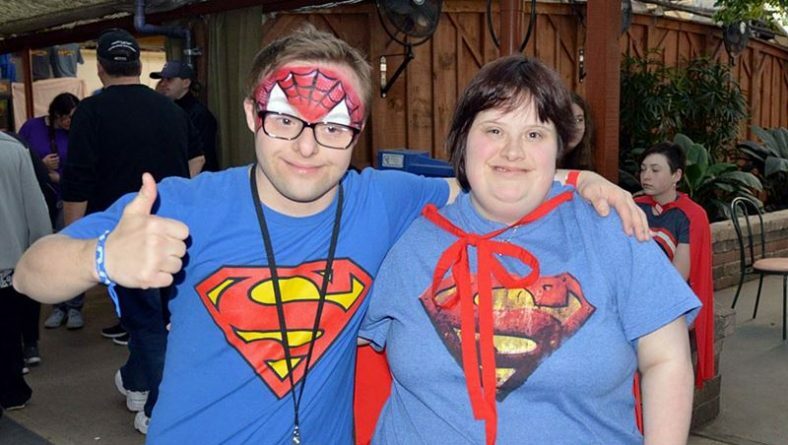 Participants of Group Hug Apparel’s 4th Annual Rock Your Socks event took time to pose for a picture in their superhero costumes on Friday, April 20, 2018. Group Hug Apparel’s annual fundraiser is a Rock Your Socks day spinoff event. World Down Syndrome Awareness Day, also known as Rock Your Socks Day, is annually observed on the 21st day of the 3rd month (March 21). The day recognizes the triplication of the 21st chromosome which causes Down Syndrome. People around the world wear socks with wild colours and designs to celebrate the uniqueness, accomplishments, achievements, and kindness of those with Down Syndrome. 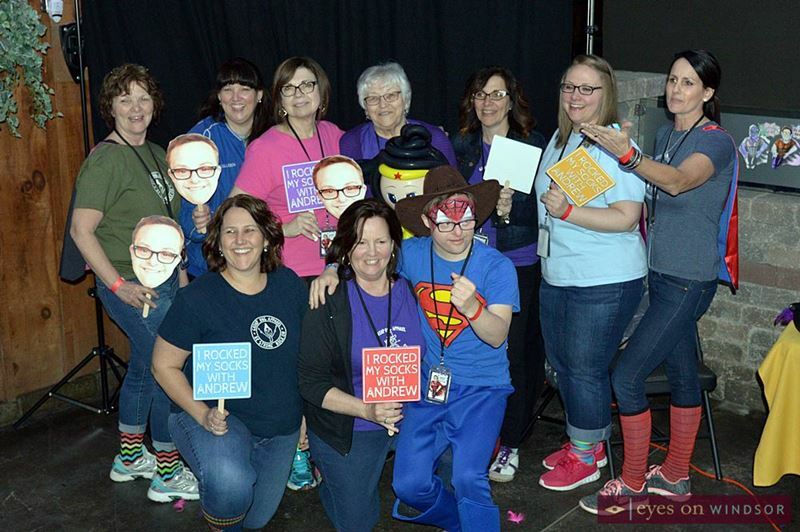 The 4th Annual Rock Your Socks organizing committee prepare for a group picture at a photo booth operated by Bianca Bennet on Friday, April 20, 2018. Photo by Eric Bonnici / Eric Bonnici. While Group Hug Apparel started out as a T-shirt company, featuring Andrew’s “be strong, rock on” drawings on them, it has evolved into a community icon of inspiration and goodwill. Andrew is the face of the Group Hug Apparel brand. He donates and volunteers with numerous community organizations. Andrew is often invited to speak to different groups, including school children, where he shares his inspiring story. Andrew has been recognized for his leadership, entrepreneurial success, and for being a positive role model, all while working part time at Colasanti’s Tropical Gardens and operating Group Hug. The business began as a way to raise funds so Andrew could attend college. He graduated from the class of 2014 at St. Clair College and has received numerous honours and awards over the years. In 2017, Andrew was honoured with the St. Clair College Alumni of Distinction Award. In addition, Andrew received a 2015 Canadian Down Syndrome Hero Award, and a 2012 Queen Elizabeth II Diamond Jubilee Medal (presented to him by Essex MPP Taras Natyshak). More recently, Andrew was honoured with a United Way Leadership Windsor/Essex 40 Leaders Under 40 Award for his commitment to community service. Essex MPP Taras Natyshak and his family join Andrew Banar and his mom Karen during the 3rd Annual Group Hug Apparel Rock Your Socks fundraiser held at Colasanti’s Tropical Gardens on Friday, March 31, 2017. Photo by Eric Bonnici / Eyes On Windsor. 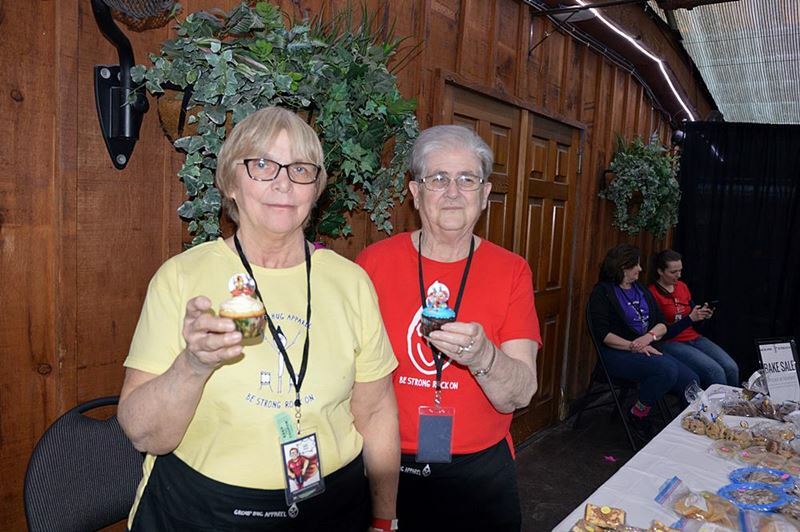 Volunteers holding cupcakes that were being sold during a bake sale that took place at the Group Hug Apparel Rock Your Socks event on Friday, April 20, 2018. 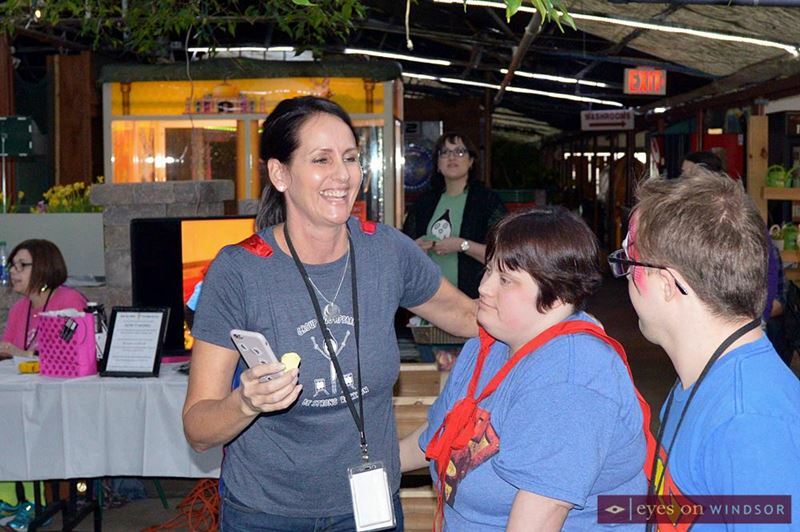 Karen Pickle of Group Hug Apparel smiles while thanking guests for attending the 4th Annual Rock Your Socks fundraiser at Colasanti’s Tropical Gardens on Friday, April 20, 2018. 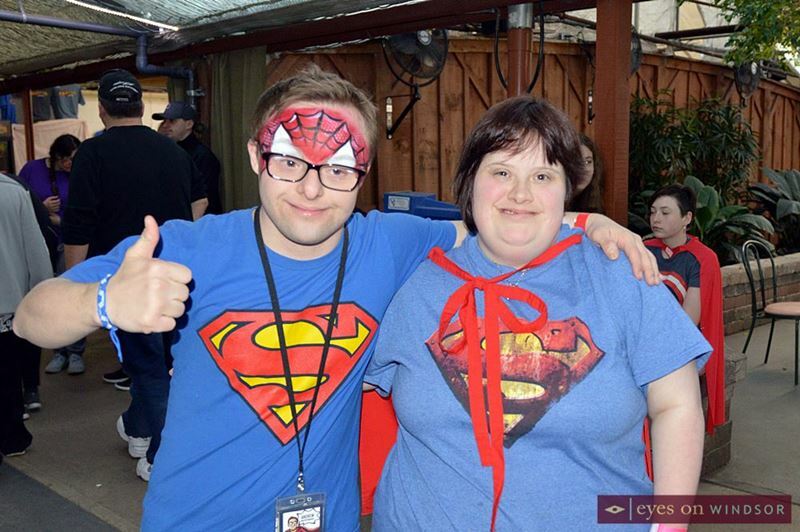 Andrew Banar dressed as Spiderman during the 4th Annual Group Hug Apparel Rock Your Socks fundraiser on Friday, April 20, 2018. Photo by Eric Bonnici / Eyes On Windsor.